Patti graduated from Michigan State University with a Bachelors of Science Degree (Zoology) and worked as a zoo keeper for eight years. After having children, she went back to school to study Veterinary Technology and became a licensed veterinary technician in 2012. Patti began her veterinary work at a small animal practice. 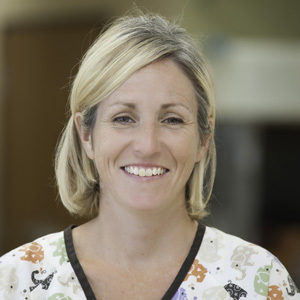 While she enjoyed getting to know clients and their pets in that setting, Patti always had an interest in Emergency Medicine, which eventually led her to join AEC in early 2015. "Animal Emergency Center is a very exciting place to work and learn. The staff here is extremely knowledgeable, kind and thoughtful. I am proud to be a part of helping bring animals back to health and provide quality care. As a client and as an employee, I have entrusted my pets emergency care to the incredible staff at AEC." Patti is a married mother of two children. Her family's pets include an older golden retriever and yellow lab, and a much younger golden/lab mix puppy that they are raising for Leader Dogs for the Blind (until he is approximately 1 year old). They also have a lone cat! Patti loves to read and is very involved in Elephant Welfare issues. She and her family love to go camping and spend time outdoors.